The Titan Bluetooth Module enables low latency wireless connections with controllers and consoles compatible with Bluetooth technology. With the Bluetooth Module installed, the Titan Two device is capable of handling up to 4 Bluetooth connections simultaneously. 2 are for input devices, 1 for output and 1 for programming and configuration. The Micro-SD card extends the number of available memory slots on the Titan Two device as well as to enable the use of binary macro files. It also is used to store the necessary files to initialize the Titan Bluetooth Module and the Xbox Wireless Adapter. The Titan Bluetooth Module features a Dual-Mode Bluetooth 4.1 Class 1.5 controller with basic rate (BR), enhanced data rate (EDR) and low energy (LE) support, for up to 4 active connections and 55 meters range. The Titan Two is equipped with a low latency interface that connects the Bluetooth Module direct to the micro-controller, ensuring the fastest response time to wireless connections. 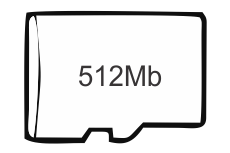 The Micro-SD card expands the Titan Two capabilities beyond the limited internal flash memory. 30 Day Money Back Guarantee - If for any reason (within 30 days of receiving the Titan Two) you are unhappy with it, just return it and we will give you a full refund of the purchase price. No questions asked.